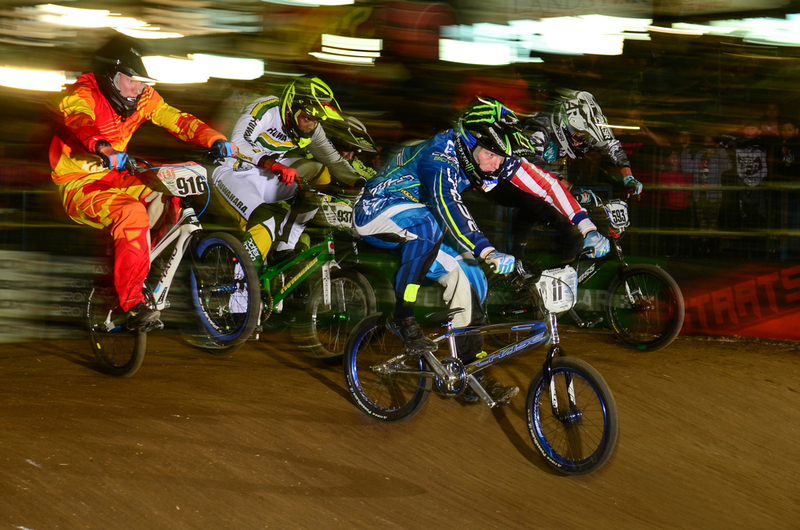 The last regular Pro series race of the 2014 USA BMX season, the Race of Champions gives the Pros one last shot of gaining points for the overall title of the year. With the top 4 spots overall in the USA BMX Championship so tight, it would be a last push for anyone to have a shot of moving up in the overall rankings, and Connor Fields was looking to do just that. Sitting in 4th overall, Connor was just a few points out of 3rd and needed to have a solid score to do so. On Friday, when the ROC kicked off, it looked as if the Chase team came to win, as Connor, Joris, and DHR Pro Anthony Dean were all flying out front of the qualifiers all day long. Both Connor and Anthony rode their way into the main event, where Joris just missed out. With a 3 main event format, it would be the rider that was the most consistent and have the lowest points after all 3 rounds. Connor would set the tempo for the night with the Holeshot award and the win in Main #1, edging out Sam Willoughby. Connor Collected the holeshot award and got prepped for the next 2 rounds. In Round 2, the strength of the AA class shined through as this time, it would be Sam Willoughby to take the win and Connor to just be off the start ever so slightly, but keeping him back mid pack. Going into the last round of the main events, it would come down to the finish of the 3rd round to crown the nights champion. Connor once again had the quickest gate start and held the lead through the Pro section, with Sam Willoughby hunting him down. It looked like the only way Sam would be able to gain any distance on Connor would be a mistake from Fields, and unfortunately, he did just that, by slightly over jumping one set of doubles, scrubbing momentum, and letting Sam pull beside him. The 2 fastest riders of the night would drag race to the finish line, with Sam just edging out Connor as well as taking the overall for the night. Connor would wind up 2nd but still have a strong showing and feeling good with his riding for the night. The Chase team now sets it sights towards the USA BMX Grand National on Saturday night, and with this finish, Connor sets himself up to finish the season off strong and move onto the podium for the overall Pro results.